A few years ago I had a a severe acid reflux problem, which affected my vocal health to a great extent. Being a professional singer, I needed my vocal health reestablished in order to continue working. An ENT from Bhopal, India, was one of the doctors who assisted me during that period. I was not very prone to taking alopathic medicines, and so, I had convinced him to accompany me differently: I would do my own healing experiments, and he would observe/comment on my progress. “Please do so, I will share it with my other patients. It will help them”. And so here it is. A step by step guide dedicated to all singers who might be struggling with this issue. Please keep in mind that the information shared on this article is based on my own personal experience and some information I received from different doctors. The information is, therefore, fundamentally limited. Yet, they are a humble sharing of a personal successful journey. It is my intention that this article may shed some light on the issue of acid reflux and sore voice which affects so many singers. note: In case you don’t know exactly what is acid reflux, LPR and silent acid reflux, read this article before. It will allow you to better understand what I am writing about. So, your voice is sore, and you suspect having acid reflux problems? The first step would be to get a proper diagnosis. I lost over 1 year trying to figure out what I had, and being misdiagnosed. I hope you don’t waste your time like I did. Here are some tips for a proper diagnosis. If you know you have acid reflux for sure, and you are sure that you don’t have a hiatal hernia, skip this section. If you are not sure, read on. Silent reflux diagnosis can be elusive sometimes. Some ENT doctors might rely on pure vocal cords observation to diagnose it (either via laringoscopy or using a special mirror and a lamp) + observation of other symptoms (vocal soreness patterns, etc). There are other tests which are more precise and may be more expensive, such as PH monitoring. Since these tests were fairly expensive/not easily accessible at that time, I decided not to do them. If you also don’t have access to these tests, you will possibly have to rely on vocal cords observation (endoscopy or mirror image) + symptoms observation. The doctor will look for patterns of inflammation and other signs typical of this condition. At the time I got tested (2015) there was no consensus in the medical community concerning vocal damage caused by acid reflux. Some doctors believed it could happen, and treated this condition regularly, while other vehemently denied this diagnosis. When you book an appointment with an ENT, I’d suggest you ask right away if he/she believes in acid reflux damaging vocal cords. Consulting with a doctor that does not believe in this diagnosis limits the possibility of diagnosis precision. You want to have all chances on your side. If you have to consult with doctors who don’t believe in this (depending on each country’s health system, you may not be able to choose your doctor), then there is something you should ask when you get examined: ask if your arytenoid cartilages are slightly inflamed/red. 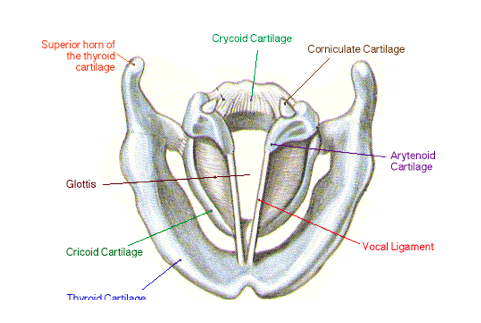 In this image you can see the vocal cords (vocal ligaments) and the arytenoid cartilage. The arytenoid cartilages are directly connected to the vocal cords, and they participate in the act of speaking/singing. They are also closer to the food tract. So when acid reflux occurs, the arytenoid cartilages are more easily exposed to the abrasive effects of your reflux than your vocal cords are. In severe cases of acid reflux, the vocal cords might present inflammation as well, but in mild/intermediate cases your cords might appear perfectly fine while your arytenoid cartilages might be infamed. If your doctor says your arytenoid cartilages are inflamed, take this information as a hint - this might be a case of silent acid reflux. Vocal soreness patterns: Another big sign of silent acid reflux causing vocal problems is the time of the day in which your voice is most affected. Everybody has relaxed (slightly hoarse) vocal cords right away after waking up. However, if you notice that your voice is still sore a couple of hours after you wake up; that it gets slightly better as the day unfolds; if you take a nap after lunch, you may wake up with a super sore voice; these are signs that you may be refluxing while you sleep. Vocal damage caused by other reasons, such as vocal nodes, wont improve as the day unfolds. The vocal damage caused by nodes will be relatively consistent throughout the day, while soreness related to acid reflux might show some improvement within the same time frame. It is important to note that the improvement of the vocal condition caused by acid reflux within the time frame of one day is not very dramatic. You have to know your voice quite well in order to notice it. Usually singers can do this fairly easy though - just practice for as long as you can in the morning. Maybe 15m will be your maximum, maybe a bit more. Maybe you can barely sing two phrases. It doesn’t matter how long you can sing for. Do whatever you can, don’t force your voice. Then keep quiet during the day, protect your voice, dont expose your self to pollution, air conditioning, or excessive conversations. When the evening arrives, do the exact same practice as in the morning. Do you notice a slight improvement? Can you sing a bit longer? Are the notes more easily accessible? If yes, this is your second big hint. Hiatal hernia - The next step in diagnosing my condition was to check the possibility of a hiatal hernia. Hiatal hernia is a hernia in the sphincter located between the stomach and the esophagus. These types of hernias are not as common, but if you have it, whatever treatment i describe here wont be of much help. In my case, after doing lots of research on the subject, I decided to do a medical test and know for sure if I had it or not. The test I did was an endoscopy - they put a little camera down my food track and filmed everything in there. They can verify the presence of hernias, ulcers, etc. I was happy i did this test, which in my case was negative. I was slowly gathering more and more information about the actual state of health of my body, and this is fundamental for a successful treatment. 2 - Learn to detect acid reflux patterns in your body (specially silent reflux!) - you will need this ability to do step number 4. Some people have very clear symptoms of stomach acidity: burning sensations in the stomach/esophagus region. Yet, LPR, or silent acid reflux is a mysterious visitor. It happens, but we don’t notice it. It might happen during the night, when we are sleeping; or it might happen during the day, but cause no sensation at all. No sensation at all? Well… look a bit closer. You might find that ‘silent’ reflux is not so silent after all. It is actually very soft, almost imperceptible… but if we pay attention we can feel it. In the same way that a musician learns, with practice, to listen to ever more subtle sounds, likewise, with self-observation and awareness, we can develop the sensitivity in our esophagus. We can learn to feel when a liquid is coming up, and gently, ever so gently, burning the throat region. Develop this sensitivity, it will help you a lot. One way to start developing your perception is through burping. Do you burp? Not everybody does, but people suffering from reflux are very likely to burp. If you do burp, use it in your favor: Pay attention to what happens after the burp. Often times, there will be a reflux right afterwards. You can use the burp as a call to enhance your body awareness, and become attentive to reflux sensations. Training your perception in this way, you may start to perceive reflux symptoms in other occasions as well. The perception of the reflux sensations can be developped only during waking hours. It is not possible to observe them while we sleep, so all the information in the following section concerns to day time reflux detection. Stomach pattern - it comes before eating, when you are with an empty stomach, and right after a meal. Liver pattern - it comes 1.5h-3h after a meal. Dr. John Douillard says that liver pattern is related to liver conditions. The livers starts acting on the digestive process at approximately 1-2h after a meal. If we have liver problems, reflux will happen at that time. He also says that stomach pattern, on the other hand, is related to stomach problems. Usually you will see a predominance of liver pattern with some stomach pattern episodes, or vice versa. That means that there won’t be a radical differentiation of symptoms, but you can detect a predominance in either one of these two tendencies. I cannot say for sure if this doctor is right, but applying this notion to my healing protocol helped me a lot! Can you recognize a predominance of one of these patterns in your system? Great! You are slowly getting more information about your condition. Now, if you have a liver pattern, for example, it doesn’t mean that your liver has problems but all the rest of the digestive system is well. Or vice versa, stomach pattern doesnt mean stomach is the only source of problem. As I progressed in my healing journey I found, at the experiential level, that when one organ in the digestive system is compromised, all the digestive system as a whole is also somewhat compromised. Yet, by getting information on which part is most severely affected, I was be able to adapt the treatement accordingly. I came to realize that I was refluxing due to two main reasons. I believe these reasons apply to most people also. emotional distress: it can include traumatic events that trigger stress response in the body (stress can deeply affect/impair digestive system); ongoing emotional challenges or situations you feel trapped in; conflict with people around, etc, etc. You can read this article for more information on how stress affects digestion. wrong diet: eating foods you are allergic to, junk food, or heavy meals on a regular basis. These two main causes will feed on each other. Negative emotions might generate cravings for junk food or overeating. And eating all those things might make you feel down emotionally. A negative spiral that is! I used to wonder if I should treat the emotional aspect or the nutritional aspect in order to get healed faster. I believe now that it is necessary to work on both at the same time. You may follow all the diet protocols you want, eat like a saint for years and years. But if you still are burning inside with unprocessed emotion, I believe your belly won’t heal completely. And vice-versa: working on emotions only but eating lots of junk food might work for some exceptional individuals, but most likely won’t take you very far on the healing journey neither. I suggest doing both. Diet work + emotional processing. In this article I will cover to some extent the topic of emotional healing, but will focus more deeply on dietary guidelines. I do this because emotional healing is a vast subject, each person might have his or her own way of addressing it. I won’t go deep into describing what I did for emotional healing, but I will just mention that I was accompanied by a psychotherapist, specially because my vocal loss came immediately after a traumatic period in my life. I did lots of meditation and lots of exercise (exercise kept my morale high, and my mind fresh). I also did whatever it took to solve problematic situations, remove myself out of toxic situations and express whatever needed to be expressed. 4 - Diet - what to eat, what not to eat. You might have read/heard all kinds of advice on what to eat and what not to eat when you have this condition. While some advice are quite effective and may work well for the majority of the population, some don’t apply to you as an individual. Each body is different, and has different dietary needs. I tried all kinds of diets, from the ayurvedic advices from my doctors in South India, to the traditional Chinese medicine protocols; from eating only fruits, fasting on coconut water, to eating a “no carb” diet (some people say complex carbs generate acidity). Some of these diets worked to some extent. For instance, the “no carb” diet did reduce acid reflux episodes a lot. Yet, it also made my hair fall, and it took long time for my hair to recover. The Ayurveda guidelines also helped to some extent, yet not completely. The fruit diet helped a bit. However, it gave me even worse reflux once I went back to normal food. Why? I am not sure. And even though frutarians might disagree with me, eating only fruits was weakening my system. I did extensive research on different dietary philosophies, following diet protocols from great Ayurveda doctors, Chinese doctors, and doing loads of self experiments, I finally came to one realization. Nobody, no doctor, no philosophy, as knowledgeable as they might be, seemed to know exactly what my body needed. There is, though, one source of trust worthy information when it comes to what you can and cannot eat: your own belly. Talk to your belly, listen to your belly, enter a dialogue with your gut. Just like you might learn to perceive subtle acid reflux episodes, which are barely noticeable, you may also learn to perceive distinct gut responses to the food you eat. Now the process of observing gut reaction is a subtle one. And it might take a bit of time. But it is the key for your healing. This is the foundation for your recovery. So I will just say it again: entering a dialogue with your belly, and learning to perceive distinct gut responses is the key for your healing. One way to keep track of it is through a food journal. I wrote down meticoulously, every day, everything that I ate, and how I felt afterwards. Was there bloating? Excess of burping? Burning pain? General discomfort? Tiny little bit of discomfort? Feel it all out. I personnally went deep into this self inquiry, and ended up becoming deeply connected to my belly. I was most of the time listening to it, and sensing its responses. The body speaks. Your belly will tell all the secrets you need to know - what diet you need to follow, what works and what doesn’t. By self observation, I learnt a lot. I watched the symptoms and correlated them to certain foods. I created hypothesis and tested them out. Sometimes it took weeks of self observation before some correlations became confirmed, some other times correlations happened right away. What are your obvious triggers? Eat a diet free of them for a few days. Your symptoms might improve, but may not improve completely. If that happens keep observing and write down all the reactions you observe while eating other types of food. At the end of every week, observe your food journal and look for correlations between certain types of food and intensity of symptoms throughout the past 7 days. In my case, I started finding interesting correlations which I wasnt aware of before. big portions of complex carbohydrates accentuated reflux. It would be even worse if i ate them by themselves without any vegetables. That included oatmeal, rice, potatoes, dhal. Small portions of complex carbs, however, seemed to be well digested. big meals, in which my stomac felt full, also. lots of different ingredients in one meal, even if all the ingredients were “healthy” accentuated symptoms. It seemed as if my digestive system was so weak that it couldnt eat complicated meals. Simple meals with fewer ingredients worked better. Now, these correlations were easy to be noticed. Some other correlations, however, were more mysterious. It took a bit more of detective work to notice them. For example, I realized, after many weeks, that if I eat wheat (gluten), I will softly yet continuously reflux for 3-4 days in a row. Imagine! Although finding out this very strong response from my belly towards this food was a big surprise, I actually was not so shocked - it is well known that many people develop allergic reaction/intolerance to the gluten in wheat. Helas, I seemed to be one of them, at least for the time being. Another one that was not so easy to find, but which I discovered over time: eating too much sugar - any type of sugar, including fruits - will not in itself cause reflux, but will inflame the digestive system, and make it more prone for refluxing in the days that follow the excessive sugar consumption. Coincidentally, Ayurveda and TCM both advise against excessive fruit consumption, and even more against refined sugar consumption. lack of water (dehydration), specially chronic dehydration, is not good for digestive system health. I started drinking lots of water. Healthy fats, such as avocados and coconut oil were tolerated only in low quantities, in the beginning of the healing process (fat digestion is a liver/gall bladder function, by the way! So that was another big sign that my liver/gall bladder was in bad shape). Anything above 1/2 an avocado, or 1 tbsp of oil induced reflux. With time my body’s ability to digest fat improved, I was able to take bigger portions. Nuts, almonds and seeds did well if I soaked them in water and ate them in small quantities. Soaked nuts are way easier to digest than dried ones. On the other hand, anything above 25gr approx of nuts were bound to provoke reflux. Smaller meals worked best, every single time but didn’t fill me up as I was used to. So I started having 5 small meals a day, instead of 3 big ones. mixing fruits with other foods aggravated the condition (except dried fruits, it seemed). Interestingly enough, both Ayurveda and TCM (traditional Chinese Medicine) also advise to eat fruits alone, without any other type of foods. going to bed with an empty stomach - like many doctors suggested - was not good. I was having my dinner at 6:00pm, and not eating anything till the next morning. This didn’t work for me, I discovered together with my ENT doctor. He suggested I ate something light before going to bed. It did wonders. Sometimes, having some light meal right before sleeping will save your night and your voice on the next day. Yet, it had to be very light, in my case. I experimented with a bit of rice and vegetables, or oatmeal, but those made the condition worse. Fruits worked best. 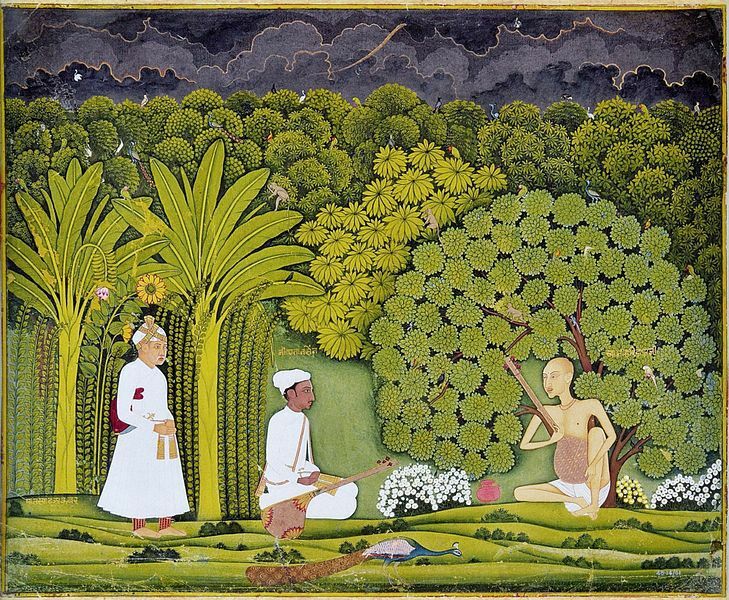 As you might have noticed, many of the conclusions I arrived to coincided with the ancient wisdom of the ancestral medicine traditions of Ayurveda and Chinese medicine. I was happy to arrive to these conclusions through self observation though, and not through blind faith. Some other advices from Ayurveda and from Chinese medicine didn’t do good for me, most probably because general dietary guidelines cannot cover all the specificities of different body types. So I consider it important to find out what applies to you individually via direct self observation. I observed gut responses day in and day out. I took notes, made hypothesis, tested my hypothesis out, came to conclusions. The days, weeks, months passed by, I felt like a scientist, doing research on my own human abode. I agree, this process is not easy, and requires a lot of focus and determination. You must be somewhat passionate about your healing and about recovering your amazing singing voice to do such complicated self observation tasks. But trust me - it is worth it. After two months of thorough self-observation I had come up with what I call: “a personalized healing diet protocol”. Your version of a healing diet will for sure differ from mine, depending on your body constitution, needs, and your environment as well. I will share with you what I came up with for my own personal needs. Take inspiration from this, see what works for you, adapt it to your own body requirements. I think it will take you even less time to come up with your own healing diet version - i have given you a lot of info here which I myself didn’t have at that time. 8:00am breakfast 2 - soaked nuts with some soaked dried fruits and soaked oats (for some unknown reason, cooked oats gave me reflux). Sometimes I’d put some flax, chia, or hemp powder too. But not all at the same time. A bit of mild spices, not much. 11:00am lunch 1 - quinoa or potatoes (no rice in the beginning, although later on i was able to take it) with cooked lentils without any oil nor spice (2/3 of a cup of complex carbs in total) + small portion of protein sources (soy protein, tempeh, nuts, sprouts, paneer, etc) + steamed veggies and/or salad. I could eat low carb veggies as much as i wanted, with 1tbsp of oil + bit of salt. A bit of mild spices, not much. 5 - keep to the healing diet STRICTLY. Imagine a broken bone. How do you heal it? You put it in a cast for a while. I consider that any digestive system that is periodically refluxing is in a very bad condition. A healthy digestive system is just not meant to reflux. A somewhat impaired system might reflux occasionnaly. But if you are refluxing regularly, your belly is in really bad shape. Just touch base with this fact. Your gut needs help. The same way you may put a cast on a broken bone, you also can put a “cast” on your digestive system. The healing diet protocol is a “nutritional cast” so to speak. It will have to be a rigid determination for a couple of months. Think about it, how many years of wrong diet did it take to get you to this level of gut damage? So sticking to a healing diet for some months is not long at all compared to that. Your body is actually healing quite fast if you compare it to the years of digestive abuse. But just a few weeks of treatment won’t do it. Gather and muster all your determination, and put a digestive cast on your guts for a little while. Being invited for lunch, or having to eat the food everyone eats at home, was not working for me. I would have to eat all that gluten, all those fried goodies, all those spices… when invited somewhere, i tried to explain i couldn’t eat certain things, but people would get tense, not knowing what to offer me. I realized over time that I had to put all these collective meals out of my life for the time being. Instead of facing all those awkward explanations/situations or having to eat stuff that was bad for me, I made the decision to make my own food everyday, and eat peacefully, quietly, *alone*. I avoided social meals, for the time being. It didn’t last forever. I just put the ‘cast’ on for a few months, and then took it out. Some people, me included, use food as comfort to our emotional discomforts. I had many many emotional cravings, specially in the beginning of the protocol. Cravings were the number one pitfall, making me get off my healing path. I would actually even call it differently. Emotional eating or strong food cravings for foods that impair your healing process could also be called ‘addiction’. I know it may sound like a strong word. But that is what it is at its core. Here is a definition of the word “addiction” : “the repeated involvement with a substance or activity, despite the substantial harm it now causes, because that involvement was (and may continue to be) pleasurable and/or valuable”. Food addiction may not be as strong as, say, heroin addiction. Still, if you cant control your eating in a time where you need to do so for your own healing, then you may see it for what it is: addictive behavior. I honestly believe, that if I hadn’t worked through my addictive patterns / craving tendencies, learn about them, and transform them I wouldn’t have gone very far in this healing journey. Working through addictive tendencies is fundamental for healing to happen, at least the type of healing I am talking about in this article. The bad news is that addictive behavior might be coming from very deep levels within yourself, and might be extremely difficult to control. Food cravings can be related to very core emotional blocks/traumas and may be deeply ingrained As a side note, I recommend the book ‘The New Earth’ from Eckhart Tolle for a deeper understanding of addictive behavior, addiction origins and addiction healing. The book itself is not about addiction per se, but there is a small section where he writes about it. You would need to read the book from the begining to understand his perspective. I found this book extremely helpful). The good news, though, is that working through addiction / cravings can be a true gift, because they will make you face some of these core emotional blockages! Might be somewhat challenging, but can be liberating!! Healing your cravings can be compared to doing a thorough emotional “spring cleanse”. And you know what? It can actually be easier than you think. Overcoming unhealthy cravings has less to do with discipline, and more to do with self observation, and inner alchemy. Let me explain what I mean. Filling up my stomach to full capacity, and even a bit more, was a way of anesthesiating myself from some negative emotion. Overeating would only happen when I had emotional unease going on. After overeating I felt belly discomfort, I felt guilty for overeating, but the previous emotional unease was not as clear as before. It was definitely not gone! It was still there, but now it was buried in a haze of belly discomfort, I couldn’t feel it so clearly anymore. Sugar urges or sweet goodies cravings came when I was feeling the need to ‘cheer myself up’. Chocolates, cakes, ice creams, you name it. Basically, it became extremely clear that every single time I ate something that was not good for me or in quantities that were harmful to my digestive system, I did it because I had some emotional discomfort I was unable to completely face. I started going deeper into the craving inquiries. If this was all caused by unprocessed emotions, could I find my way out of unhealthy cravings via emotional work? At night time, while writing on my food journal, I started to get in touch with these emotions. What was I truly feeling at that moment when I ate too much? Where was that emotion in my body? Can i still feel it? Yes, it is still there. Where is this emotion coming from? Can i go deeper into it? Can i breath into it? Can I just BE with it for a few minutes now? By going on this craving self exploration, I had a very powerful realization: I had this deep seated anxiety… and by deep seated I mean, old!! Like, from when I was a young child. Anxiety about not being good enough; about not having enough; about having to eat now, lest there wont be food later; I had anger, I had anguish, I had resentment, I had frustration. The more I inquired into the source of my cravings, the deeper i went into this inner jungle of unprocessed painful emotions. And wow, was it huge. I started meditating, breathing with them… just chilling out, hanging out with my ocean of inner pain. Not making the emotions bigger, not feeding into them, by no means rationalizing them. Not trying to argue with them, neither solving them via some thought process. Thinking had to be out of the game, if I was to heal. That much I knew, or at least, that much i believed. I have read extensively on the subject of emotional healing since a few years now, did numerous meditation retreats and self healing workshops. What I have come to believe is that: Emotions, in order to be processed, need conscious breathing… just being and breathing. With them. So I went down this road, so to speak. I gave myself full heartedly to conscious breathing therapy. I started breathing with my belly and the “inner painful ocean” for many minutes every day. I’d sit down, close my eyes, and breath. Observe the physical sensation that the emotion causes, and breath. Get lost in some thinking, realize it, come back. Breath. Feel tense inside, breath. Release into the tension, let my soul sit down a bit more comfortably into the depths of my pelvic floor, and breath. Stay there, observe, breath. See the whole display of drama and worry before my inner awareness, and breath. Breath, breath, breath. Something started to happen, as the days, the weeks, the months passed by: I started to become less driven by these emotions. When I ate, it was not the emotions in me that were eating, it was my belly that was eating. And I discovered something really beautiful: my belly craves for healthy food. It craves for veggies, for brown rice and dhaal, it craved for fresh fruits and nuts. The interesting thing is, my belly doesn’t crave for a cake filled with sugar, gluten and chantilly icing… it doesn’t crave for junk food. My inner turmoil does crave for those… but my belly craves for prana filled fresh delicious life giving food. So the question is, who is on the driving seat of my eating? When I make my food choices, who is making the choice? My emotions or the presence in my belly? And as much as I might want to have my belly in the driver’s seat, if my inner jungle of emotions remains unprocessed, I am bound to have emotional eating on the driver’s seat. Emotions, when unprocessed, take over. I strongly believe that, so I will just say it again. :) Emotions, when unprocessed, take over. You cannot avoid emotions, you have to work through them. So forget about ‘discipline only’. If you try to control your cravings via discipline only, it will most likely not work. It may work for a few days; a few weeks if you have a strong will power; maybe even more. But if you are not working through emotions, at one point emotions will take over, and emotional eating might happen. Be grateful for cravings, they are showing you the way into touching base with the inner jungle of yours! The practice of breathing with awareness is a great step in the direction of processing emotions and switching into what I call belly presence eating. Basically, this practice can be called ‘meditation’. I started making meditation an important part of my daily routine. I mean, it already was part of my life, but I made it even more important then. So there you go! By working with the cravings, and keeping a strict ‘cast’ diet, I started to heal very fast. After three months of the diet described above, I started to notice that my digestion capacities were getting stronger: I was able to eat more fat; I was able to eat bigger portions of carbs in one meal. I was getting way less reflux. Surprisingly, I also started developing a new taste for food. The vegetables became more delicious than ever. I craved for squashes! The taste of a steamed zucchini was just like heaven, and a bowl filled with steamed rice and veggies with a bit of ginger was paradise. I realized that taste is, (it really is) acquired. I was “re-educating” my taste, and felt as happy eating veggies as I was happy eating junk food before. If you decide to go on a healing diet, I will totally encourage you. It wont last forever, you will evolve through it. Be strong, be goal oriented, be present (meditate!)! And give your self this gift. 6 - get support from natural medicine traditions, supplementations and natural medicinal foods- it will accelerate your healing. I went to see different natural doctors over the years I was struggling with acidity. I actually dont think one needs to consult with many doctors. One good natural doctor will do the job. Yet, I also found in my own healing journey that, some times, seeing different doctors (throughout the months, not at the same time) was quite beneficial: each one contributed with one piece in the puzzle. Also, it may be important to note that the guidelines from these health practitioners alone did not heal me completely, but when I united their assistance with my personal healing diet protocol, I started to see better results. Another reason why I saw several doctors is that I was changing countries every 6 months. When in India I went to see the Ayurveda doctors. When in Montreal I consulted with the acupuncturists and the naturopaths. When I went to visit my mother in Latin America, I consulted with the energy healers and the homeopaths there. Each time I was getting better and better, each encounter/meeting taught me something. I actually enjoyed quite a lot exchanging information with all these health professionals, i ended up doing a detailed research on acid reflux natural therapies, without even planning on it haha. Ayurveda (ancestral India’s medicine) - One thing that helped me a lot were the herbs I was taking from the ayurvedic doctors. Just by checking my pulse they knew my liver was in bad condition, and without me saying anything, they gave me herbs to disinflame and detoxify it. One ayurvedic doctor also gave herbs to clear emotional trauma and stabilize the nervous system. I like herbs a lot: they are excellent at clearing and purifying internal organs, acting on the emotional layers of our being as well, with no bad side effect. Of course, you must get treatment from a good doctor, else, taking the wrong herbs can have adverse effects as well. Overall, the ayurvedic doctors were of great help. They always emphasized on the following: diet + herbal treatment + emotional release/stability + proper sleep/rest/exercise. They would tell me to practice asana, meditation, relaxation, etc, as stress is a big impairment for digestive system. Acupuncture - it is a great way to balance your overall energy, and it might help a lot in healing the digestive system. The beautiful thing about acupuncture is that the needles work on both physical and emotional level at the same time too. If it’s accessible to you, I’d totally recommend it. The needle treatments helped me release old emotion (it works! ), helped me feel centered and relaxed, helped tonify digestive function, etc. Overall, the acupuncturists recommended diet care, peacefulness, emotional release, etc. Same as the Ayurveda doctors. Homeopathy - the homeopathic treatment I received seemed to work at very deep levels, releasing emotions from childhood related to the issue I was treating. Very powerful yet subtle. Highly recommend it. Naturopaths - I liked very much meeting with a naturopath. She was the first doctor to ask me in detail everything that I was eating, and to give feedback on it. I had to actually write down a list of all the food i was taking. She also gave me some herbs, told me to do castor oil packs on the liver (they helped a lot!). Supplementation - The naturopath also pointed out that I was suffering from anemia (a simple blood test proved she was right.). When digestive system is very weak, it cannot absorb the nutrients properly. For example, anemia can happen easily in people with impaired digestive systems, specially women, and even more so vegetarian women. So if this applies to you, I’d recommend you get your self checked. Specially if you have taken anti-acids (anti-acids further inhibit the absorption of iron). Here are some obvious signs that might indicate low iron: scanty menstruations (less than 4-5 days), hair fall, pale complexion. Having noticed an important deficiency in one a fundamental mineral, I decided to do blood tests to check the possibility of other deficiencies. My B12 levels turned out to be extremely low as well, and the doctors prescribed me B12 shots. Some people say B12 shots are not the ideal way to address this issue, but I decided to go for it. The improvement was drastic - not only i became more energized, optimistic and feeling revitalized, I also notice something quite powerful: my voice started to heal much faster. When i did have acid episodes, my voice was not as badly affected as before. Over the days and weeks that followed my B12 shots, my voice started to get better and better and better. I asked my ENT about this, and here is what he said: “B12 is required for the healing of mucous membranes - which include your vocal cords. If your levels of B12 are very low, the deficiency might have delayed the healing of these membranes in your body”. Amazing! I kept taking my B12 shots religiously. And most importantly, I made sure my diet included good amounts of B12 on a daily basis, and wish to do so for the rest of my life. B12 is so important!! Having noticed B12 and iron deficiency, I questioned my 15 years of vegetarianism/veganism. I still don’t know what to think about this matter. But this is another issue. I won’t go into this discussion here. 1) check all your levels and address whatever deficiencies you might have. The body is a mysterious orchestra, we cannot predict how and why some deficiency might affect your specific condition. But for sure, a well nourished body with all the nutrients it needs is way more likely to heal. 2) i am not a big fan of taking artificial supplements. I feel the best way to ensure you get all those nutriments is by having a very healthy balanced varied diet. Yet some supplementation might be very helpful, depending on the context. Lots of info is available out there about it, I wont go into much detail here. Now here are some natural medicines for acidity. Of course, many other options are out there, these are only the ones I used. Before you try any of these, consult with your doctor, see if this suits your system. Lemon - In my case I had liver problems. One thing that helps liver greatly is the juice of one lemon in 1 cup of warm water, first thing in the morning. Don't drink/eat anything else for at least 30m to let it be well absorbed. I saw drastic improvement once i started drinking this every day. Aloe vera - recommended by Ayurvedas and naturopaths alike, aloe vera is great for soothing and disinflaming your digestive system. The Ayurvedas recommended me 1 tbsp of aloe with 1 tbsp of honey and a pinch of curcuma. I took this every morning for 2 years or so, it helps a lot. There are different ways in which you can take it: directly from the plant (just get an aloe vera plant, cut one leaf and scoop out 1 tbsp of the transparent gel), or buy an aloe juice bottle in a health food store. I actually don’t recommend the bottled juice because a) it has citric acid as conserving factor b) it is not fresh c) it is extremely easy to get fresh aloes and d) the real plant is cheaper than the bottled one. Why not just eat the real thing, void of any chemicals / industrializing process? Liquorice - liquorice was the one plant recommended universally by all natural doctors, be it Ayurveda, Chinese medicine, naturopaths, you name it. Make a tea with it, take it in powder, or just chew on it. Whatever way is better for you, you can do that. But they did recommend to take it daily. Liquorice soothes your esophagus and your throat, it creates a protective coat around the inflamed tissue, and if you believe herbs act on subtler levels, liquorice is no exception. It will help you with the emotional aspect of your condition as well. sleep on the left side - depending on which side you lie down, the stomach/esophagus sphincter will face up or down. Try it out for your self - sleep on the right side, and see how much easier the reflux episodes will happen. Now, on the left side, they will happen less often, because the sphincter is facing up (gravity is helping you!). I actually developed a habit of always sleeping on my left side for a while, it worked. elevate the bed - same principle - using gravity to help alleviate the symptoms. It didn’t work for me actually, but many people get relief from this. Yet, for me it was clear, and so it was for all the natural medicine doctors, that taking these medications would actually make my healing process go backwards. My digestion was in bad shape because I had a sick liver; I had wrong eating habits; I had food allergies; I had inflamed bowels; I had loads and loads of unprocessed emotions in that region of the body. Taking a chemical pill that would impair the ability of my stomach to produce digestive juices was not going to cure any of that. Quite on the contrary, it would make my digestive system even weaker, make the disease sink deeper. If you want further information about anti-acids / PPI and how they impair your digestion, you can read this article here. I never ever took any and I am glad I didn’t. One thing that saved my skin is that i kept track of my symptoms. I was following a strict diet, being a bit depressed because i couldn’t sing, and facing many other challenges. At times my morale was very low, and I started to lose my will power and determination to continue with the treatment. It is hard to abstain from certain foods, specially when we feel down and discouraged. The cravings would come… Plus, sometimes, I’d have a relapse, have a long period of intense acidity, and I would easily come to the conclusion that all my efforts were in vain, that none of this was working, that i might as well give up. But at those dark moments, I’d come to my computer, and see this little chart I had made. This chart had data I collected daily since many months. The data I was observing was quite simple: 1) number of perceivable acid reflux episodes per day and 2) how many hours i was able to sing daily. For any scientist out there reading this, you might notice that my data collection system is very subjective. Yet, it was what I could observe, and it served its purpose. What was amazing to see is that in a short term and middle term vision, there was no improvement, or barely any. Sometimes there was even a worsening of the condition!! But! On a long term vision (3, 4, 6 months) the improvement was quite noticeable. I made what we call a “trendline”, which is basically an average tendency of the data collected. The trendline showed clearly that the reflux episodes were gradually coming down, and the amount of singing hours was slowly ( s l o w l y ) going up. Never mind that I had all these relapses; never mind that i still faced days in which I could barely sing 30min. Never mind any of that. The chart proved it: I was getting better. And so I found my motivation to keep sticking to my healing diet protocol, and keep having faith. Now, I totally understand that not everyone is into making charts like I did. While I am fascinated by mathematics and numbers, some people might hate numbers. I’d suggest you keep track of your symptoms/improvement in some other way then. Whatever works for you. And if you decide not to keep track, then at least, remember what I shared in this section with you - that progress might be very slow; that you might feel you are not getting better. But keep on. Keep the determination alive. This is a fundamental part of the healing. The cyclical nature of healing - I observed an interesting pattern in the healing process: improvement happens in cycles. Smaller cycles and bigger cycles. I’d get better for a couple of weeks, and then have a relapse. Get better for a couple of weeks, and then have another relapse. Like this, on and on. Yet, over the months, I saw that the relapses started to become less intense, and the recovery periods started to reach higher plateaus. That is when I noticed that healing happens in cycles. Recovery didn’t come in a straight line. There were even yearly cycles. Every year or so there would be a huge setback, only to find a bigger breakthrough afterwards. Curious, isn’t it? Observing the cyclical nature of healing helped me a lot. Three years later into the healing journey, and after many months of singing wonderfully, I had a huge relapse. Instead of freaking out, I just observed it as another cyclical manifestation of healing, and relaxed. I knew I was bound to heal even further once the relapse phase passed. I just had to stick to my healing habits. Does this cyclical pattern apply to everyone or it just happened to be like that with me in particular? I don’t know. But I’d like to suggest that if you have relapses on your healing journey, and you are sticking to your healing process diligently, to look deeper into it. These relapses might be just a cyclical expression of healing! Vocal cords - Now, you may wonder how healing happens in the vocal cords. Vocal cords heal fast once acid reflux stop. It is a matter of hours for slight improvement to happen, and a matters of a couple of days or weeks (depending on severity of symptoms) for an almost complete recovery. If the arytenoids have been badly affected, according to my ENT, it might take a bit longer, but they will heal. The difficult/time consuming process is to get your belly to stop refluxing naturally. This will depend on the severity of your symptoms and how well you stick to your healing protocol (working on both diet and emotions). One question I had, and which scared me a lot was: is there a risk of permanent damage to the vocal cords? According to the ENT doctor who assisted me, if you force your voice and keep singing when vocal cords are affected, if you sing very strong, for long periods, you might develop a vocal node. Vocal nodes are potentially permanent. So there you go, this is your risk of permanent damage. But keep in mind that acid reflux alone will not give you nodes. Singing a lot while having acid reflux will. So while your voice is affected, take vocal rest, practice music in other ways, discover your creativity elsewhere. Let your voice chill out. It will come back. How long did the diet last? - Did I have to stick to the “cast” diet for long time? The super rigid diet didn’t last more than 6 months. Soon I was able to eat a more varied diet. By varied I mean: more ingredients, a bit more spices, more fat, etc. But what happened is that I started loving the natural simple diet I had come up with. Like I mentioned before, I switched: from choosing my food with my emotions, I started choosing foods with my belly awareness. Every time I looked at a meal, I’d feel right away in my belly if my body liked it or not. If the food was heavy or toxic, my belly would contract in disgust. And even if it tasted “good” in the mouth, it “tasted” bad in my belly even before I tried it. the opposite became true also. Food that agreed with my belly became super tasty and attractive to me. And so, sticking to the natural diet became my second nature. This is the way that I eat up to this day, not because I feel obliged to it, but because that is what makes me feel healthy and happy. I have way more flexibility, I can even eat an occasional heavy meal when invited somewhere, or when going to a restaurant - I am attending social meals now, and I am going to different restaurants too. But I try to keep these to a minimum, and make sure I have plenty of healthy light meals in between. in my case it took me 1 year to get a clear diagnosis and 1 year to try different diet protocols / come up with my own healing diet. Once I found my healing diet, it took me 6 months of “cast” diet for significant recovery to happen (going from 2h to 4h of daily singing). It took another 6months of a somewhat flexible “cast” diet to go from 4h to 6h of daily singing. So, as you see, the healing in itself doesn’t take long. What can delay the healing process is the trial and error, the searching for treatments. My hope is that in reading this article, you might save a lot of time in your own healing journey. Hormonal balance - For almost 15yrs I had had hormonal problems. The hormonal imbalance i suffered from made me have super irregular menstrual cycles (at one point 2 years without a cycle! ), hirsutism (I even had a bit of a beard, which I had to treat with laser!) and many other symptoms. In search for a solution my family had taken me to the best endocrinologists they knew. I saw endocrinologists in Mexico, in Brazil and in Canada; I had also seen natural doctors, Ayurvedas, Chinese medicine, etc - I tried many different treatments. I had seen some improvement, but I wasn’t completely healed. My menstruation was still very irregular, sometimes it would come after 21 days, sometimes it would take 60 days. An irregular menstration is a sign of many other hormonal irregularities. The natural doctors told me to just get used to it, sometimes it is not possible to regularize these cycles. I had given up. Yet, after 6 months of this healing diet I came up with, my menstruation become completely regular. For the first time in my life! And it has stayed like that so far, my cycle now varies between 28 and 30 days. When I tell this to some doctors, they dismiss me saying that I must have lost some weight with my diet. Losing weight, they say, helps balance the menstrual cycle. To which I always replied: “I did not lose weight”. My weight has been stable, with a +-2kg variation. I just healed my belly, and hormones followed naturally. b) Belly well being - I had always had this uncomfortable feeling in my belly. Since I was a kid. It was like a mild constant contraction/pain/inflammation. It just didn’t feel right in there. I am sure many people can relate to this feeling of constant background unease in our guts. I had gotten used to it, and I even believed it was part of reality. It was just the way it was. Yet, after this process, for the first time in my life, I felt completely at ease in my belly. It felt comfy and fresh in there. What a great feeling it is! The best gift I could have given myself - to be healthy and at ease in my own guts. c) Colds - i was constantly getting colds. There was one year when I got around 8 colds, including two bouts of bronchitis, fever and all that jazz. I also started having allergy problems. I rarely get sick now and allergies are gone. d) Candida infection - I had chronic candida vaginal infections for many years. After healing my belly, this is completely gone. Once an Ayurveda expert said something that helped me understand why i got these extra healings: “you see, all disease in the body, according to Ayurveda, starts in the digestive system. Once you heal your digestion deeply, it becomes much easier for the body to find its balance in other spheres as well. The digestion is the powerhouse, so to speak. An impaired digestive system, over the years, can give birth to very serious diseases. In healing your belly, you get off the disease road and get on the long living health road” . Did I heal completely? I healed approx 90-95% of it. I still reflux occasionally, if I had some strong emotions, or if I ate heavy meals. I am back to singing 6 hours daily most of the time though, which is great! My ENT doctor said digestive system takes time to heal, and I should observe further improvement with time. According to my charts (!) that should be the case! Healing acid reflux proved to be a much deeper journey than what i thought - i healed my relationship to food, to self nourishment and to my belly; i healed my menstruation cycles; and i learnt that with determination, self-observation, and consistency, I can heal myself. The body has its own healing intelligence. If we learn to listen to it, and learn apply what it says, we can come back to radiant health. This our innermost nature. In our essence, we are health. We are consciousness. We are creative power. Happy healing journey to you all! I recently published an article on www.gaia.com in which I give a general overview on Nada Yoga and then share with the readers a specific vocal exercise from the tradition I study from. I had great feedback from many readers, hope you enjoy as well.